We undertake full inspections and surveys of towers and bell installations of all kinds. 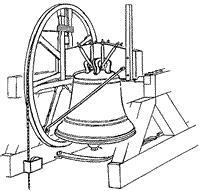 A typical inspection will look firstly at the whole building be it a church, clock tower or whatever to determine any particular problems which might be involved in the installation or repair of bells. A detailed survey of the tower structure will then follow during which any visible structural problems will be noted. Finally the bell installation itself will be examined in detail and a full tonal analysis of any bells will normally be made using the latest computer technology. Such an inspection will take an average of two hours to complete for a typical ring of six or eight bells and the production of the report will often involve more than a day of additional time. As a result of an inspection we normally render a fully detailed report, together with recommendations, specifications, estimates and drawings. It is our policy not to charge for this initial visit where the building is on the British mainland and for other areas in the world we ask merely for our expenses. In an average year we will undertake about 200 inspections and surveys which together represent a vast store of experience and knowledge.